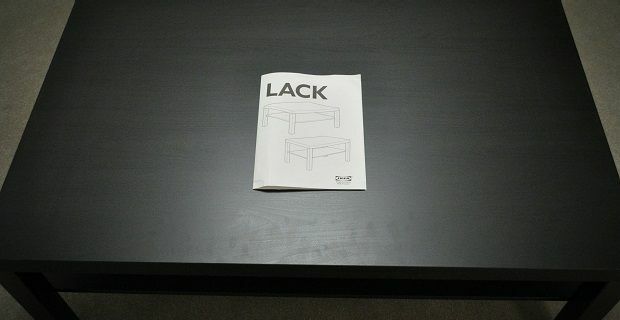 Ikea has a reputation for cheap, okay quality stuff that’s awkward to put together at times. It’s a place that’s known as much for its food hall as it is for its flat-pack furniture. Assuming you’re heading to your local Ikea for a side table, what materials are used to make the thing? A table is made of wood, right? The type of wood determines the price. We all understand that. If a wood is rare or harder to forest, it will be expensive. Plentiful stuff will be cheap. We all get that so you would be safe in assuming that the Ikea lack tables that retail for around £8 are made from some type of wood, right? Let’s drop any idea that there’s a solid piece of wood in your coffee table. That would make it heavy and expensive. This is a lightweight, cheap bit of kit. It’s throwaway furniture that’s designed to live a limited life. If you have a leak in the room this thing sits in, it will be soaked up by the table. That should give you a clue as to what’s inside these flimsy bits furniture but not the whole picture. We’re not talking about the tables that tell you what they’re made of. There are loads of coffee tables and side tables that retail for at least £100 which are made from the real thing that used to be a tree at some point in its life, what we’re talking about are the lack tables that retail for £8. For that sort of cash you can’t expect much, but you probably don’t expect the table to be constructed of cardboard. There’s a honeycomb construction made of card and paper that is used to create the table. Ikea don’t hide this but they don’t advertise it either. You can either be up in arms about it or just say to yourself – what else can I expect for £8?